Nowhere on Earth are sequels and the success that fosters them more apparent than in Hollywood's bejeweled bedroom, Beverly Hills. This continuation of the history begun in Arcadia Publishing's Images of America: Early Beverly Hills presents a compendium of vintage photographs depicting America's one community that's most synonymous with wealth. However, the Great Depression hit here, too, and the book depicts that as well as the subsequent recovery and boom years, homes of the stars, influence of the close proximity to Hollywood, and the chic shops and restaurants that keep the tourists coming. 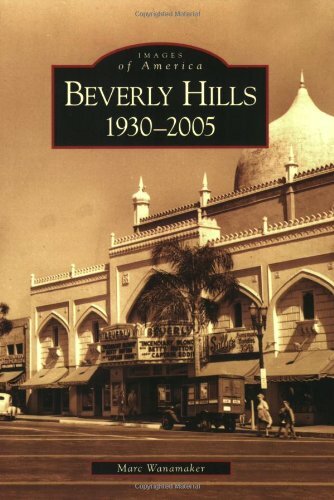 From the Brown Derby to the Beverly Theatre, from the Harold Lloyd Estate to Jack Warner's digs, from the Beverly Hills Hotel's changes to those that created a new Beverly Hills Civic Center, these are the Beverly Hills facts that have been the bases for all of those Hollywood fictions. Author Marc Wanamaker owns Bison Archives, one of Southern California's largest repositories of historic photographs, from which he selected these rare images. A consultant on more than 100 documentaries and the author of Arcadia Publishing's Early Beverly Hills, Hollywood: Past and Present, and other books, Wanamaker is a founding board member of the Beverly Hills Historical Society.